SGA is shared memory, so it is allocated when the database is started. 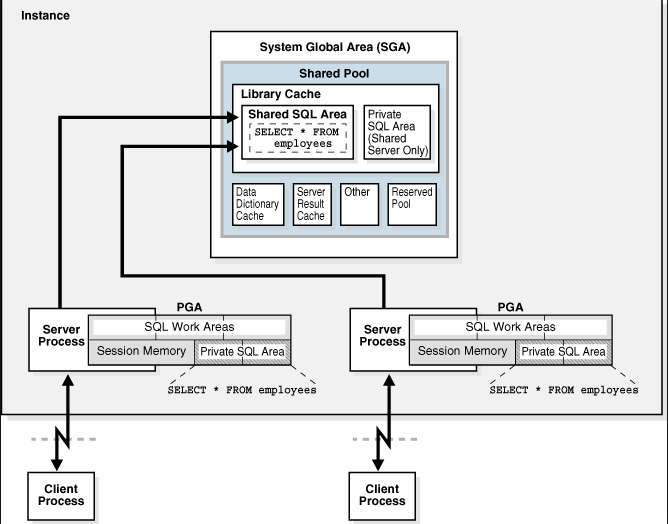 Shared memory is important for the Oracle Database System Global Area (SGA). where multiple processes share a single chunk of memory to communicate with each other. SHMALL ==>(40% RAM), total size of Shared Memory Segments System wide set in “pages”. ORA-27123: unable to attach to shared memory segment. Linux-x86_64 Error: 28: No space left on device. is not relevant when you use /dev/shm POSIX shared memory (Oracle AMM). SHMALL is the division of SHMMAX/PAGE_SIZE, e.g:. 1073741824/4096=262144. Make SHMALL smaller than free RAM to avoid paging. Oracle recommends that the SHMALL should be the sum of the SGA regions divided by 4096 (The Linux page size). For performance reasons,any Oracle database that uses more than 4 GB of SGA should use kernel Huge Pages. Note:Linux kernel Huge Pages are setup manually, use 2M (2048 KB) pages, cannot be swapped and are reserved at system start up. AMM uses either Sys V(virtual) shared memory(ipcs) including kernel hugepages or (POSIX) /dev/shm for SGA, but not both at the same time. With HugePages, the Linux memory page size is set at 2MB (instead of the default 4K). This will improve OS performance when running Oracle databases with large SGA sizes. The AMM and HugePages are not compatible. One needs to disable AMM on 11g to be able to use HugePages. See Document 749851.1 for further information. Starting from RHEL6/OL6, Transparent HugePages are implemented and enabled by default. This is causing node reboots in RAC installations and performance problems on both single instance and RAC installations. and if they are  specified, the non-standard block size caches. DB_CACHE_SIZE - ->RAM buffer for the data buffers DB_XK_CACHE_SIZE SHARED_POOL_SIZE ->RAM buffer for Oracle and the library cache. LARGE_POOL_SIZE -> For RMAN parallel queries & Parallel execution allocates  buffers out of the large pool only when parallel_automatic_tuning=true. PGA_AGGREGATE_LIMIT -> (12c),limit on Total PGA per Instance can't be below the PGA_AGGREGATE_TARGET. ** To revert to the pre-12c functionality,set parameter value to "0"
Get confused about how to calculate SHMMAX and SHMALL on Linux. Why Execution Plan gets changes? How to fix Bad SQL Plan? How to fix Bad SQL Plan? . Let’s take look at what they are and differences? SQL profiles and SQL plan baselines help improve the performance of SQL statements by ensuring that the optimizer uses only optimal plans. ==>SQL plan baselines are proactive, whereas SQL profiles are reactive. ==>SQL plan baselines reproduce a specific plan, whereas SQL profiles correct optimizer cost estimates. 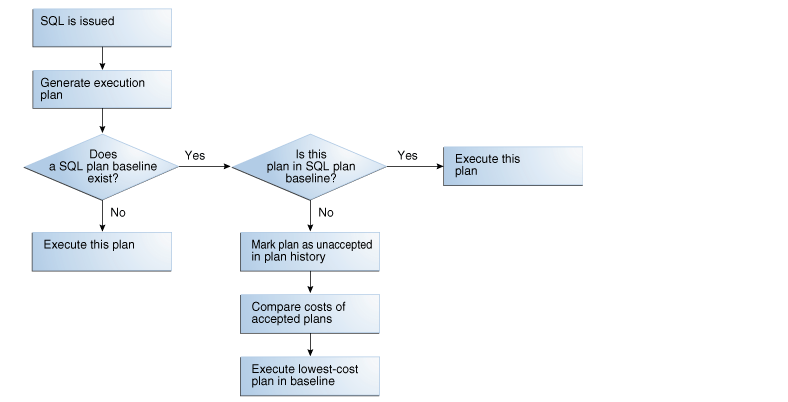 SQL plan baselines prevent the optimizer from using suboptimal plans in the future. 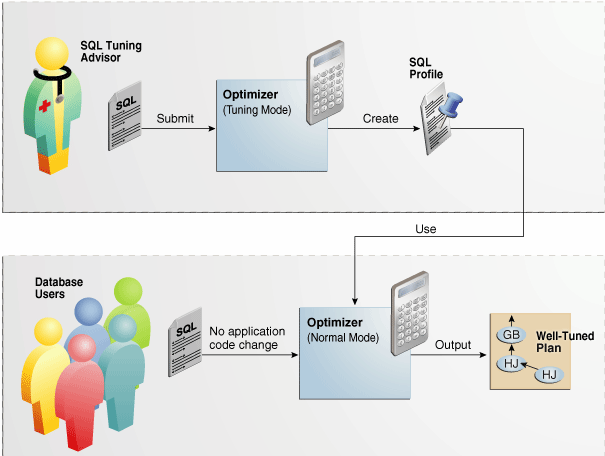 Image flow of SQL Profile & SQL Plan BaseLine. with plan 2141716862 linked to adjusted sql_text. A potentially better execution plan was found for this statement. Consider accepting the recommended SQL profile. Some alternative execution plans for this statement were found by searching the system's real-time and historical performance data. The following table lists these plans ranked by their average elapsed time. See section "ALTERNATIVE PLANS SECTION" for detailed information on each plan. What is the difference between SQL Profiles and SQL Plan Baselines? DBMS_ADVISOR–>Details of How to execute SQL access advisor (DBMS_ADVISOR)? 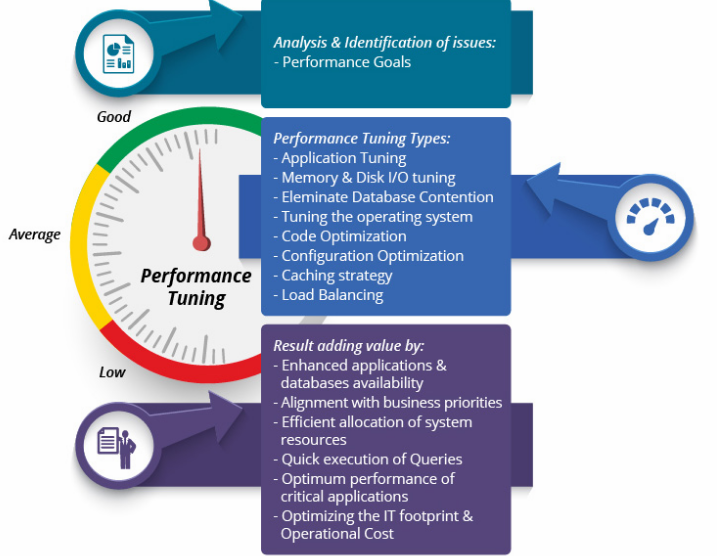 DB Performance Toolkit –> Overview of Performance tools (AWR/ADDM/ASH,SQLT & SQLHC) & What data you need to collect for Performance Issues for Oracle SR?